Mental illness has been stigmatized for a long time now. 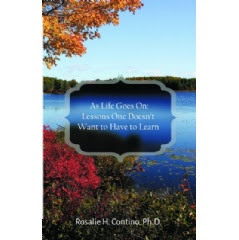 In Rosalie Contino’s new book, “As Life Goes On: Lessons One Doesn’t Want to Have to Learn,” the author reveals a true story of how a so-called stigma rewarded precious memories in return. Bob was suffering from schizophrenia. And with deceased parents, Bob had no loved ones to care for him in a way a family member would. So Rosalie, having made a firm promise, looked after Bob with loving concern in his last months. Their experiences—tales of impatience, humor, love, and a lifetime’s worth of lessons—are treasures Rosalie keeps. “The book allows readers to view mental disorders from a more understanding perspective. Bob was quite a character. There were times I wanted to give up completely, but I learned to appreciate him in a way I never had,” the author said. With words that will move readers to laughter and tears, this book is a gem. To know more about Rosalie Contino and her books, take the time to visit her website at rosaliecontinobooks.com. Written by Rosalie H. Contino, Ph.D.
Book copies are available at amazon.com, litfirepublishing.com, and other online book retailers. Dr. Rosalie H. Contino, PhD also has a degree in elementary education and an MA in educational theater. She’s had experience in costume design and costume consultancy. She occasionally works as a production lecturer. She resides in Brooklyn, New York, and has two other books.